It’s easy when we hear so many bad stories about couriers to brand them all with the same reputation, but a lot of the couriers that handle our precious games are barely making minimum wage, often below that, with shockingly poor working conditions. While that isn’t a justifiable reason for the worst couriers to throw our boxes of games onto the roof in the pouring rain, if we’re fortunate enough to have a good courier then it’s worth thanking them, and this time of year especially (if we can afford to do so) it’s good tip them a little. We often choose to tip the waiting staff when we eat out, but is the worker bringing us our precious board games, books, CD’s, and board games any less important? That’s right, I’m listing board games twice because they are obviously that important. And yes, please tip your waiting staff too because they work darn hard (I’m certainly not trying to downplay the work that wait staff have to do, again it’s hard work for low pay and I personally would hate to hand out food all day without being able to have a nibble or three). They don’t want to be at our door at 8PM any more than we want them to be. Even if we can’t afford to tip our courier, a smile and a thank you doesn’t cost you anything, and from a purely pragmatic point of view, will likely mean that your packages will be treated better in the future. And if our courier just isn’t one of the good ones? Well, let’s lead the way in trying to improve the situation. After all, if our bosses made us poop in a bag in our trucks to avoid giving us a proper break time (allegedly, that’s right Mr. Lawyer, I said “allegedly”… why do you still have your pen in hand? ) then we wouldn’t probably be in the best frame of mind for dealing with strangers either. If we show some manners and tip (even a small tip) then maybe our couriers won’t have to stress so much about punishing deadlines and quotas and they’ll be able to take the time to deliver our goods in a better manner. 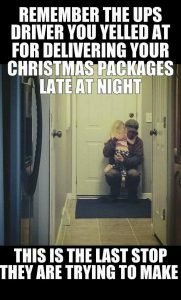 That’s true of both our couriers and our postmen, who often have to work crazy hours at this time of year to keep up with the demands of their employers. It’s easy to complain. I’ve done it myself, and if I’m honest, I probably will again some time. But instead of just complaining, let’s strive hard to be the positive change that we want to see. Let’s improve the situation as best we can, however we can, so that we can all benefit together. And if Amazon sends your presents out without wrapping, and your family members see what you’ve bought them, please remember that it was Amazon and not the driver that made the choice to do that. There is a box you can tick when you checkout online for gifts, you have to look closely but it is there. Let’s start now. Drop us a comment below with the tales of your “courier heroes”. Tell us about a courier that worked hard to get your delivery to you safely and quickly, that went that extra mile to provide good service, or that always arrives at your door with a smile. I’ll start us off. I have a courier from DPD who, if it’s a heavy delivery and I’m not around, will always carry it into the hallway so that my family don’t have to. We used to have a Hermes courier that, if I was out, would leave their phone number so I could text them when I got home and they’d pop straight round with my package, and another courier who always has a warm smile. Sure, I’ve dealt with some pretty bad instances in the past, but I’ve had plenty of good ones too.